Oh, come on! It is just water. Go to your sink and splash around for a while. Yep, this is the same picture you saw on the previous page. Why? Nothing happened. 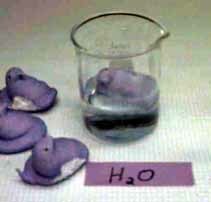 Of course, Peeps resemble birds, and ducks are birds, and ducks float (and don't usually dissolve), and therefore Peeps should float (and not dissolve). Please note, this same line of reasoning can be used in theological arguments. For example: God is love. Love is blind. Ray Charles is blind. Therefore, Ray Charles is God.